oh, sweet joy! : sponsor highlight + giveaway: "we like pretty things here"
sponsor highlight + giveaway: "we like pretty things here"
you have a few more days to enter last week's group giveaway, so click here and get after it! 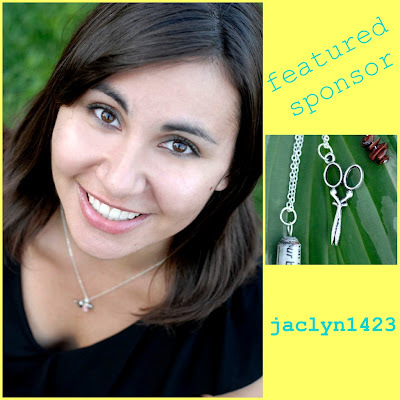 Meet Jaclyn, the gal who runs the eclectic etsy shop, Jaclyn1423. Her slogan of "We Like Pretty Things" is pretty accurately portrayed in this shop! 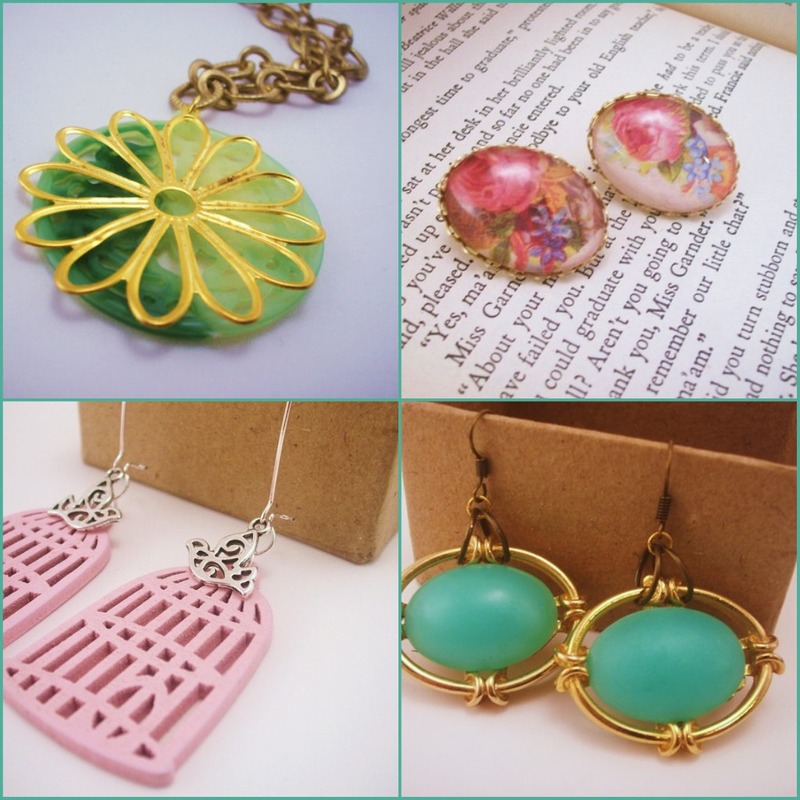 Everything in Jaclyn's shop is handmade, upcycled, vintage, or all of the above! Triple win. I love that the jewelry found in Jaclyn1423 has a vintage feel, and everything is SO unique. I LOVE when handmade artists stick to their style. Jaclyn is offering all of you sweet readers a chance to win this GORGEOUS vintage pendant, valued at $20!. Isn't it fantastic?! Geometric shapes are SO popular right now, so you will definitely be styling rocking this unique piece! 3. tweet/facebook/blog about this giveaway (one entry). 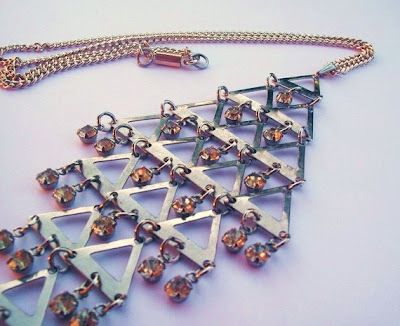 I just entered to win a SWEET vintage geometric pendant from @jaclyn1423 on @ohsweetjoy's blog! Make sure you go over to Jaclyn's shop and poke around. You will definitely find something you can't live without! And just in case you do, feel free to use the discount code 14ohsweetjoy23 for 15% off your purchase! I love the rock/paper/scissor necklaces. Such a cute twist on BFF necklaces! love the upcycled blue rose and watch face pendant necklace. gorgeous! I (@JASIVRAS) follow you both on Twitter! I love the cockatoo necklace-- so cute and colorful! I like the Triple strand illusion necklace. My favorite is the vintage spring bouquet sweet summer necklace! I love the vintage amethyst pendant! love the double pendant necklace with the daisy! From her shop, I like the CLEARANCE Holy Bible library necklace! Lots to like! For now I would have to say Vintage beads. Blue bracelets. Set of two. My favorite item from Jaclyn1423 is the Double charm vintage necklace. Glass stones. Gold and simple. Hi! love the little bauble ring! Love the Geode Slice pendant, so unique and pretty! I love the You Make My Heart Sparkle necklace. I love the Geode slice pendant, so gorgeous! I follow Jaclyn and you on twitter, @daer0n. I love the Turquoise Splatter necklace; the color is stunning!! I really love the Vintage Diamond Shaped Pendant. I follow you both on Twitter, I am @Tirabaralla on Twitter. I love the Geode slice pendant. Crystal. Marble. Vintage chain. I like the Vintage monarch butterfly necklace. I love the Cartoon heart necklace! I like the Double strand necklace .Slim antiquated gold chain. Upcycled charms. Floral and dainty. I love the splattered paint stone with the long silver chain. I think my wife would like the "Three -in-one dangling earrings" where you choose your own stones. favorite things friday: guest post from jami! summer of pies: whoopie pies!